Driving her father’s mules along the canal is a daily drudge for artistic Kelly McGregor. She longs for the day when she can break away and start selling her artwork, so that she is not forced into a bad marriage like her parents. How then will she react to being courted by a local shopkeeper? An historic Pennsylvania canal town sets the stage for three unforgettable romances. Life for Kelly McGregor is a daily drudge of driving her father’s mules along Lehigh Canal…until a shopkeeper makes her farfetched dreams seem possible. 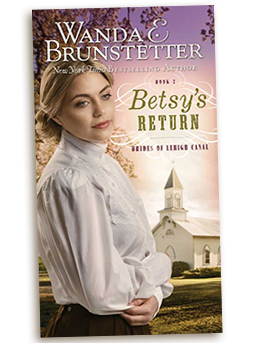 Betty Nelson is reluctant to see her minister father retire–and even more reluctant to meet the man who is to take his place. Widow Sarah Tucker longs for a life that doesn’t revolve around canals; then a canal boat captain and a blacksmith both vie for her affection in a battle of the heart over mind. Available May 2012 from bestselling author, Wanda E. Brunstetter. Several years ago, my husband and I conducted research along the Lehigh Navigation System in Eastern Pennsylvania, where he used to swim and play as a boy. We were surprised to learn that young children and teenagers in the 1800's were often forced to lead the mules that pulled canal boats between Easton and Mach Chunk. During the months that the canal was in operation, these overworked children trudged up and down the towpath from sunup to sunset for six days a week. The money they earned was then handed over to their parents, and they received little or nothing for their labor. The research for this series was most interesting, as we were able to ride a restored canal boat, walk several miles of the towpath, and tour one of the lock tender's homes in Walnutport, Pennsylvania. 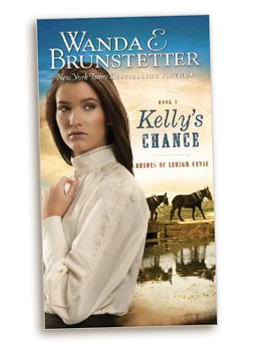 "Kelly's Chance still has the simple, clear plot that Brunstetter is known for. It also has a depth that is unprecedented for her. This is a must-read. 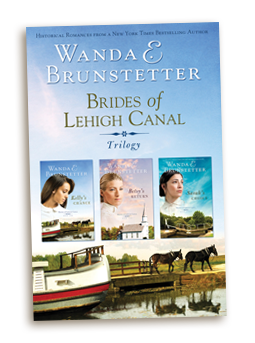 I can't wait for book two of The Brides of Lehigh Canal. I hope Kelly's sister is the main character." "Faith and family drive this story with enough plot to keep the reader turning pages, hoping for a positive conclusion for Kelly and Mike. The reader receives that wish. A sweet, sentimental story from an interesting period in history with a wrapped up happy ending." "Brunstetter beautifully captivates the reader with compassion for both of her lead characters. Whether you face transition of moving to a new town, welcoming a new family member, or a shift of roles in the workplace, this story will minister to your heart." "A sweet romance from Brunstetter that wraps up nicely and brings us back to characters we've enjoyed in previous books." 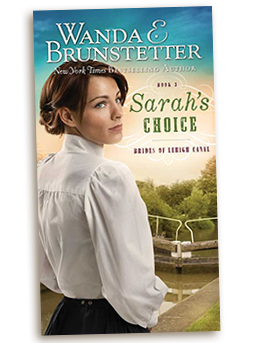 "Sarah's Choice by Wanda E. Brunstetter is an intriguing historical story that keeps you turning pages. The author has a way of bringing to life the history of the canal and its workers. This is a wonderful book that I truly enjoyed reading."